If you are a contact lens user, you must know the rules of wearing contact lenses you should obey. But many also use contact lens, regardless of the important things that should be avoided. Need to know it, the eye is a sensitive area that should really be kept healthy. 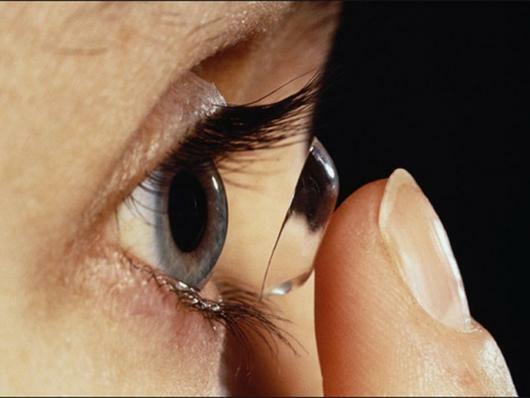 Many habits are performed by users of contact lenses, which actually should not be done. Avoid the bad habits of contact lens wear that causes damage to the eye. Things like that are what are the bad habits of contact lens wear these? For most people, nowadays the use of contact lenses or contact lenses much an option instead of using glasses. Minus glasses, plus or cylindrical, can be replaced by contact lenses. In addition, because a contact lens had little choice of attractive colors, which can make your eyes look more attractive. Not only have the eye disease minus, plus, or cylindrical, can use a normal eye contact lens. Anyone can use a contact lens, especially now that many products sold contact lenses at low prices. 1. Sleep in a state of not removing contact lenses This habit is repeatedly linked as a cause of irritation and infection. Because, if you are still using a contact lens during sleep, the eyes would automatically blink less. In fact, it took a lot of blinking eye to eye wash that does not dry out during our sleep. 2. Do not change lenses on the recommended schedule Make sure you replace contact lenses according to the schedule for eye comfort. The longer you wear contact lenses, it will cause a buildup of proteins and lipids from tears, Other risks, chronic allergies are called giant papillary conjungtivis that can cause you to no longer be able to use contact lenses. 3. Not doing the solution with respect to the contact lens If you are not disciplined always maintain eye health contact lenses, then this can make the eye where the development of germs. 4. Not removing contact lenses while showering or swimming Well water for drinking or bathing, but not safe for your contact lenses. Remove contact lenses first when you shower or swim, Swimming pool water contains bacteria or amoebae, which if it "meets" contact lenses would endanger the health of your eyeballs. Do not also clean the contact lenses with tap water. 5. Do not wash your hands before inserting contact lenses Who knows what's in your hand? There may be bacteria of the new objects that you touch or leftover food after you eat. Of course this will be a disaster. Therefore, treat your eyes with a good contact lens wearers to avoid major problems with your eyes. If you are a contact lens user, try to begin to avoid bad habits in the use of contact lenses such as those mentioned above. So you can still use a contact lens or contact lenses stay comfortable. So there is no harm for you to change your habits from now on, in order to maintain the health and beauty of your eyes. Happy reading and hopefully usefull. I like your post about "Wednesday’s Workout| Tone your arms" Really it is very nice & helpful post. I am looking for this type post & I've got it. This is so amazing post!!! I see so many articles with poorly written content that this one is refreshing. It’s great to know there are people that can write well and get their point across. Keep it up!!! Better check me to grab out $1 web hosting. I actually love reading your all the posts and subscribed you for the same. I generally deal with Cheap Reseller Hosting services, thus, if you are looking for the same do consider me… I’m available at CheapResellerHost.